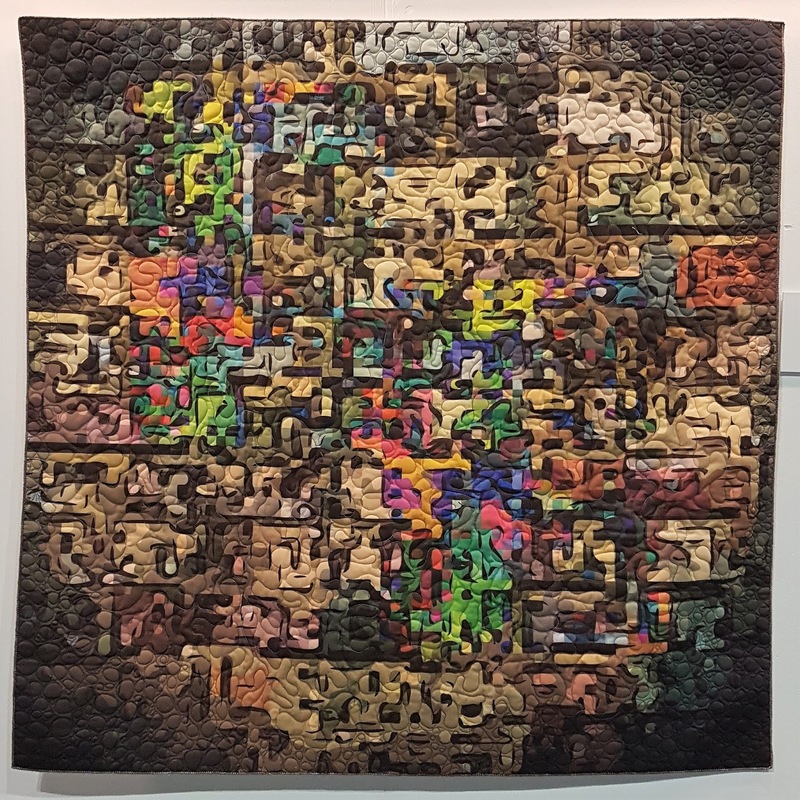 The annual Festival of Quilts was hosted at the NEC near Birmingham last weekend. Dia, Cath & Bernice visited the show separately. And here's what caught our eyes! Dia's first choice is 'Global Harming'. She found it to be sad but powerful. It was made by Susan Sami who won the Novice Quilter category. The quilt is inspired by wars and conflict around the world and the increasing number of refugees fleeing the perils of war. This quilt is by Latvian quilter Aina Muze (1943-2017) and is entitled 'Nocturne'. It was exhibited in the EQA:Diversity gallery. 'Homage to Kandinsky' by Eleanor Marsden appealed to Dia because of the composition. And lastly from Dia, 'Fractured', which represented an industrial dockside reflected in the sea. However Dia saw a broken mirror and reflections within in it. That is the great thing about art - it is not just about the idea of the artist but the reaction of the viewer. Bernice left her phone at home but after a short bout of anxiety convinced herself that she could cope. After all, before the invention of mobile phones we all managed to have a good day out. Fortunately Dia and Cath managed to take photos of the two pieces that Bernice really liked. Firstly the 3rd prize winner in the Art Quilts section, 'Metropolis' by Lesley Brankin. Bernice loved the combination of traditional quilting with the painterly effect of the skyline. Bernice also loved Susan Hotchkis' quilt 'Alderney'. Susan had been inspired by the corroding metal embedded in the harbour wall and pier in Alderney. Bernice's first reaction was that it was an embroidery rather than a quilt. It is indeed free machined but also incorporates trapunto quilting. Bernice also enjoyed the galleries set up by Unfold and Art Textiles: Made in Britain. It could have been predicted that Cath would be drawn to the bright colours in the work of Louise Mabbs on her colourful stand and Alexandra Kingswell in her gallery exhibition, ‘More than the Sum’. The mathematical inspiration behind the work of both artists was also very interesting, giving it an extra dimension. Cath particularly liked Louise’s fabric origami techniques, which create various tessellations, beautifully enhanced by Louise's signature use of these wonderful colours! The mathematical inspiration behind Alexandra’s work was also intriguing, as she has based much of it on the Fibonacci sequence of numbers, which occurs widely throughout the natural world and has influenced the work of many artists over time. Cath has always been interested in number patterns and add the vibrant colours into the mix and she was hooked! Cath found the work of Janice Gunner deeply affecting, inspired as it was by the artist's experience of recovering from a critical illness that affected the brain. The 'Pathways' pieces reflect the confused nightmares and hallucinations as well as the healing comfort of family visits. Images were manipulated and printed digitally onto fabric, before machine quilting to produce these beautiful pieces. ... and also Nancy Crow’s huge mono-prints in her gallery exhibition, ‘Self Portrait: Focus’, which were breathtaking. Cath has taken the inspiration away with her and is planning to investigate ways to incorporate these printing techniques into her future work - she had a great day.